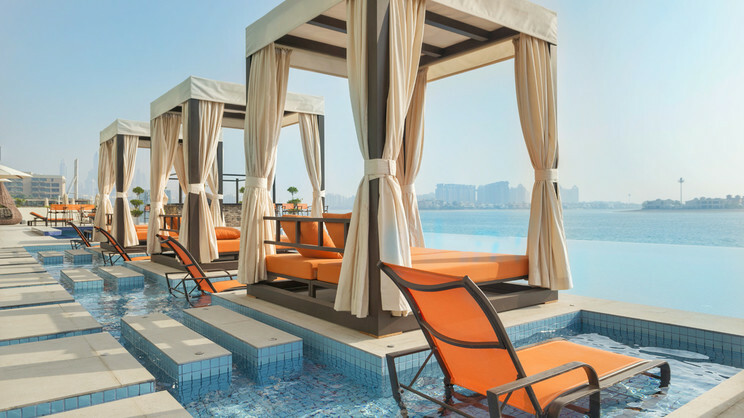 Located on the east crescent of the iconic Palm Jumeirah, the Royal Central is an ideal choice for anyone seeking to experience the many delights that a holiday to Dubai brings. This 5-star, beachside property combines style and sophistication to offer a laidback atmosphere, in which guests can relax and enjoy superb facilities, excellent cuisine and luxurious accommodation. A wonderful all-inclusive option is also offered, while the many attractions of Dubai are all within easy reach of this splendid hotel. The Royal Central is located next to the beach. A free shuttle bus also runs to Jumeirah Beach. The many attractions of Dubai are within reach of the Royal Central. A free shuttle bus also runs to the outlet mall. Dubai International Airport is approximately 42km away from the Royal Central. If you choose to go all inclusive, the programme generally consists of breakfast, lunch and dinner served in the main restaurant. During meals soft drinks, beer, water and wine are usually offered. Locally produced alcoholic and non-alcoholic drinks like water, wine, soft drinks, beer and spirits are usually served throughout the day (except during meal times).